On March 10, 2018, the Capitol Visitor Center hosted a teacher workshop to think about these issues and learn about Congress' role in time. The "Congress and Time" workshop included a tour of Capitol clocks with House Curator Farar Elliott and a session building a sundial with Lee Coykendall, Children's Education Specialist at the U.S. Botanic Garden. Do you associate daylight saving time (DST) with farmers? It is all a myth. In fact, many farmers vehemently opposed it. After all, farmers operate their day on the sun, and cows do not care about the time on the clock. So why change our clocks twice a year, spring forward and fall back? 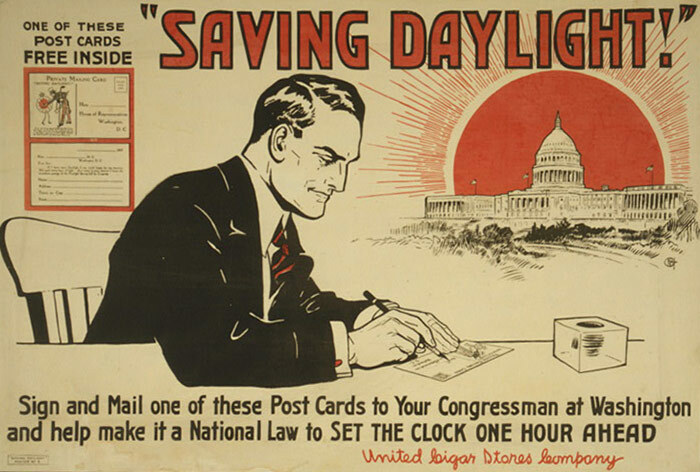 Poster from 1918 encouraging citizens to write a postcard and lobby Congress in support of Daylight Savings Time. The idea of saving the daylight goes back centuries. Ben Franklin, in a Parisian journal, advocated for it as a cost saving measure. He calculated that the city would save some 64,050,000 pounds of candle wax annually. Technological advancement changed everything. In 1869, the transcontinental railroad linked east and west. Railroads operated on their own time standards, and by 1872, more than 70 time standards existed in the United States. Imagine taking a train from New York to Chicago. As "Harpers Weekly" stated, "Any traveler trying to wend his way across [the country] was doomed to bewildering confusion. His watch was to him but a delusion." 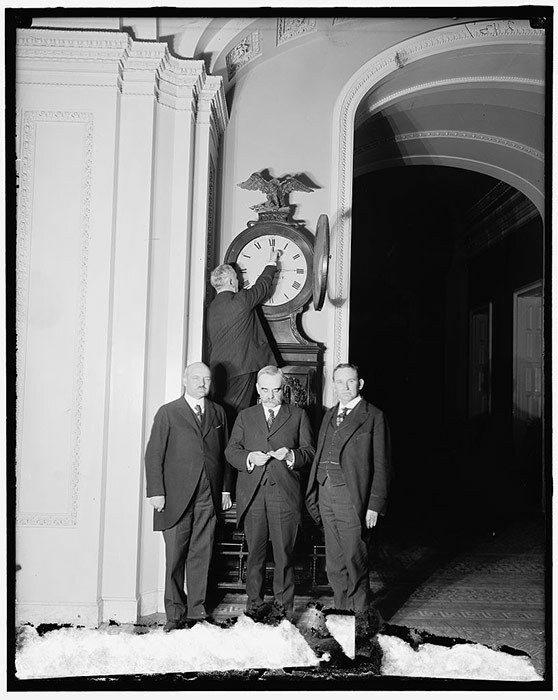 Senate Sergeant at Arms Charles Higgins turns forward the Ohio Clock in the U.S. Capitol for the first Daylight Saving Time, 1918. In 1914, Europe went to war. Two years later, Germany implemented DST to conserve vital resources like gas and electricity. Europe followed suit. Two weeks after the declaration of war on April 6, 1917, a bill was introduced in the U.S. Congress to create national time standards as well as implement DST. Congress enacted the Standard Time Act of 1918, and DST went into effect March 31, 1918, at 2 a.m. Technology and war pushed Congress to act. However, after the war, Congress repealed DST, giving authority over time to the states and local communities. World War II saw national implementation once again, but only for the duration of the war. Without standardization, a bus traveling from Moundsville, West Virginia, to Steubenville, Ohio, a distance of only 37 miles, passed through seven time standards. Congress was compelled to act again in 1966 and passed the Uniform Time Act. So, when changing your clocks twice a year, unless you are in Hawaii or Arizona, remember — it has nothing to do with farmers. It all comes back to Congress. Matt Ericson is an Education Specialist at the Capitol Visitor Center.